We were curious how far into the fall season we would make it before our first cold… well, now we know! It’s not surprising, of course. Between preschool, playgroup, motoring munchkins and music group… we’ve been fulling enjoying being 31/2 years old :). So, we spent the day in the ER. Boy is it busy on a Saturday afternoon! After waiting about an hour for a room (and we were triaged first priority) we started the asthma protocol. Henry’s wasn’t doing that bad this time as he’s already had 9 puffs of Ventolin at home, and we took him at the first sign of difficult breathing. He had one dose of Dexamethasone and then we waited to see if that was enough. The ER doctor was hoping we wouldn’t need more Ventolin and Atrovent, but in the end we did. But only one round each (5 puffs Ventolin and 3 puffs Atrovent) and then he was stable enough to come home. We are also starting a new medication – Advair – which replaces his Flovent. From my understanding Advair is one step “up” from Flovent because it is a little stronger and contains two active ingredients: salmeterol and fluticasone. These work to keep the air passages of the lungs open by relaxing the muscles and by reducing inflammation, swelling and irritation. It is steroid medication, which makes me a bit nervous… but it seems to the best option to control Henry’s breathing. Advair is a long term medication designed to help prevent asthma symptoms; it is not a rescue medication for it he is already having symptoms. Dr Seear, our Respirologist, recommended trying Advair as Henry has been repeatedly admitted due to his asthma. This year we are also going to try taking the Advair on a more regular basis. While last year we only started the Ventolin once Henry was already having trouble breathing, this year we are going to use the Advair continuously over the winter. We have two choices, and haven’t decided which one we’ll try first. Either he takes one puff daily all winter. Or he takes two puffs daily at the first sign of a cold. We were leaning towards the second option as we thought it would involve less medication overall… but if he is continually sick it may not work out that way. So we’ll see how it goes. In the end… we know he’s going to get sick and we’re going to keep having fun anyways! We don’t believe in living in a bubble… so if the consequences of having fun are colds and a few trips to the doctor – then so be it :). So… what do you do with two hungry kids and no food??? Thank goodness for the emergency stash of baby food! 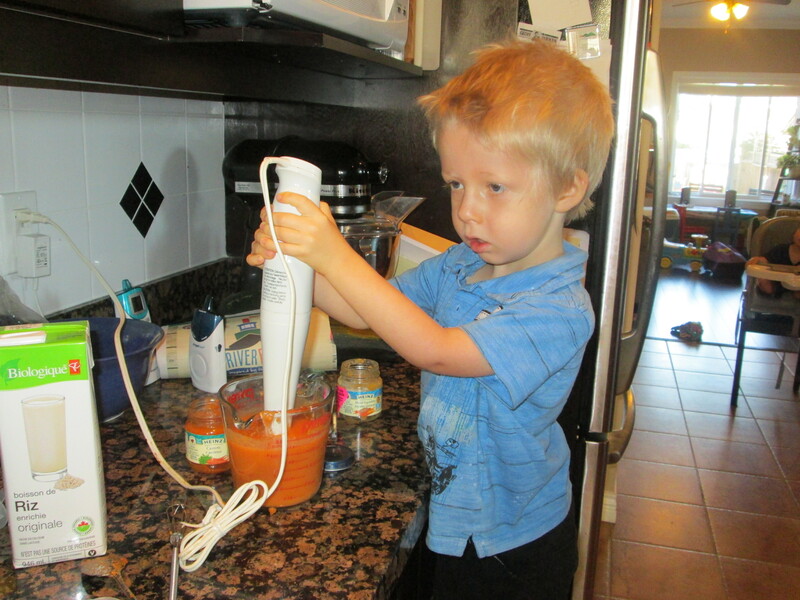 Thankfully anytime the hand blender is involved, Henry thinks it’s fun! I always have a few jars of baby food stashed at the back of the cupboard, just in case. I never quite knew what the “just in case” would be… but now I do! 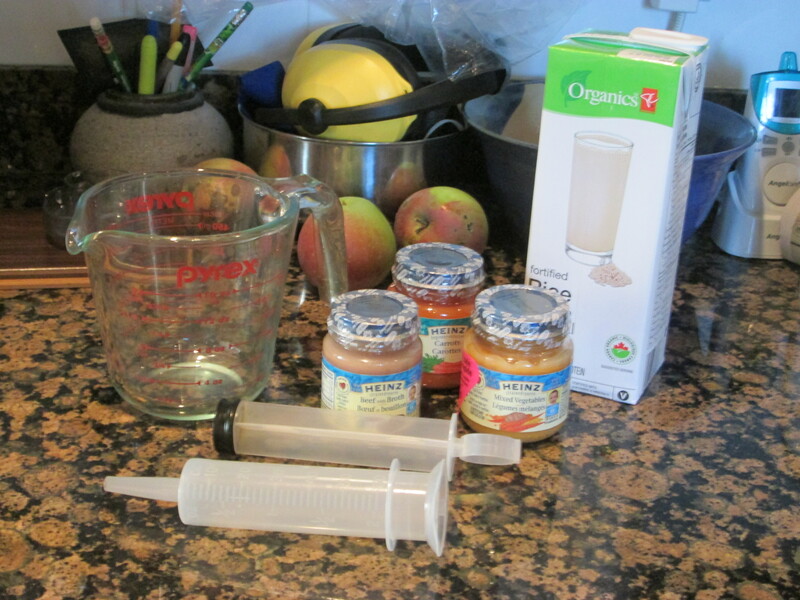 If using baby food for a homemade blended diet for a g-tube, the “first steps” or “first foods” type works best. It is smoother and typically doesn’t need to be blended. Great if the power goes out! 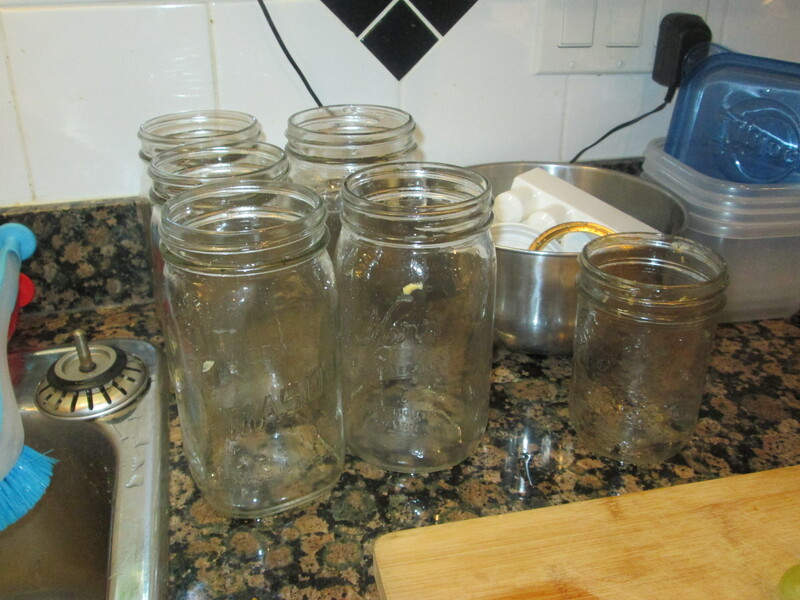 In this case, I had a few jars of the “first steps” type and a some of the “second stages”. The second stages were thicker and chunkier so needed to be blended smooth enough to go through Henry’s tube. I combined the baby food with some rice milk (I always have a few of the non-refrigerated tetra-packs around), then added in some molasses and oil to boost the calories. If I was doing this longer term, I would have also added in some tomato pasta. It certainly wasn’t the well balanced diet he typically has, nor as calorie dense… but sometimes you just have to make the best with what you have! 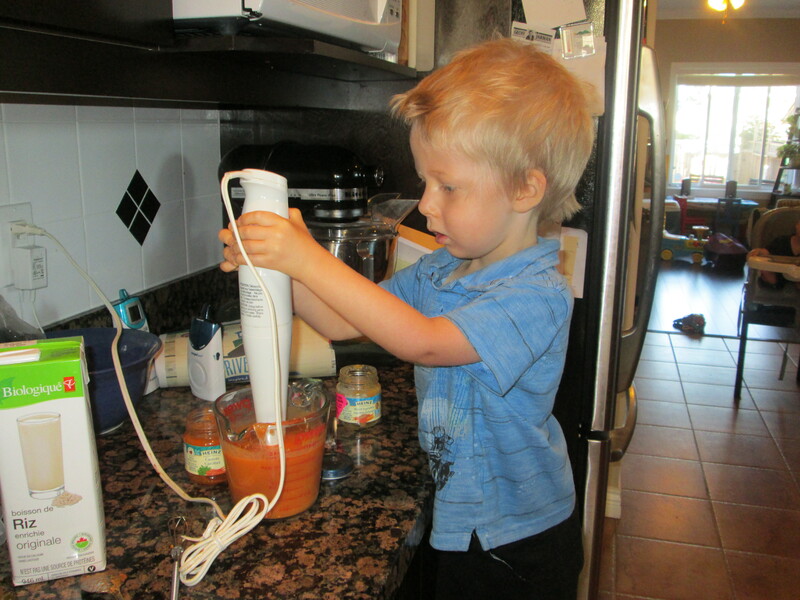 I always try to keep a few containers of food frozen for Henry too, and we used this up until I had the chance to blend another batch. The refrigerator repair person came Thursday evening, and thankfully we are back up and running again. And the good stuff continues! OMG… He bit off some bread, chewed and swallowed it! Yesterday Henry bit off a piece of hotdog bun – about the size of a crouton – chewed it, and swallowed it!! AND HE SAID IT FELT GOOD! Before I go any farther… for our close friends and family – those people who will have the opportunity to see Henry… please read to the very end. There has been a lot of lead up to this… not just general progress over the past 3.5 years, but specifically in the past few months. First he learned how to drink through a straw, which told us he could swallow larger volumes of liquid. Then he “decided” he wanted to eat only through his mouth. A great sentiment, but also a struggle as he didn’t want to eat through his tube. Then he started talking more about foods that “melt in my mouth”, and began asking if the foods on his plate would melt. Shawn or I would take a very small bite of said food and count how many times we chewed it before it would “melt” enough to swallow. Over the past month he has been tasting, licking, biting and exploring lots of different foods. He has done this consistently for quite some time, but this time it was different. Typically he would try something for a day or so, and then stop and not try anything for a few weeks. This time, he has been continuing for a longer period of time. And like most kids… he discovered ketchup! And began dipping anything and everything he could find in it, just to lick the ketchup off :). And then it happened. We were having hotdogs last night. He asked if the bun would melt in his mouth. Shawn took a bite and said it was about 10 chews for it to melt. So Henry took a bite – and teeny, weeny bite… and we counted together. “It’s in my tummy” he exclaimed!!!!!! Once again he bit, chewed, moved it with his tongue, chewed more and it was swallowed! And then he did it again… but this time he took a MUCH LARGER BITE. I have to admit, I was worried. I didn’t think he could swallow it. I didn’t want this experience to end with coughing or panic. I wanted it to end on a happy note. So we counted and chewed… moved it around… counted and chewed some more… moved it around. I think he chewed it about 60 times. His chew is quite ineffective, so it took a lot to get it to “melt”. You could see the saliva just about ready to drip from his lips. This was pushing his comfort level. But he was smiling – there were no signs of panic. And then we say it… a swallow. Suddenly he opened his mouth and it was gone. SWALLOWED!